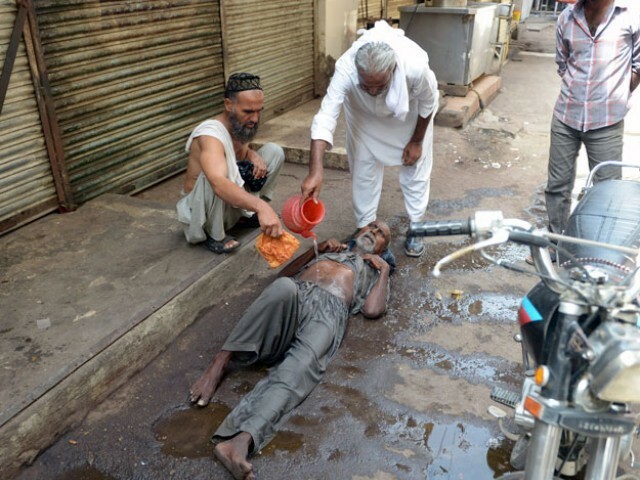 JNN 24 June 2015 Karachi : Nearly 1000 people have died in a severe four-day heat wave in the Coastal City of Karachi , Pakistan, where there were No arrangements were done , either by the Provincial or the Federal Government for the Water & Power Shortages , Or the forecasted Weather Report , which earlier clearly indicated the Blistering Heat Wave , which can take Lives , if adequate Measures were not taken . The Rich Leader of the Poor Nation who can Only Make Just Make False Big Promises at the time of the Elections to Bag the Votes of the Innocent Poor Citizens of Pakistan, for which they are now Paying a Heavy Cost , as the Leader are Busy Making Big Money in Kick Back and Corruption , while the Poor Nation is Bleeding rather Now Dyeing in Hundreds , But officials are Just Passing statements instead of doing some Productive deeds , which can save the Lives of the Poor Pakistanis. The majority of people died in government-run hospitals in the port city of Karachi, Pakistan’s economic hub of around 20 million people, as temperatures reached 45 degrees Celsius at the weekend, when the People who were out of Power, due to Long Power shortage , for which successive govts have Made Big Promises of eradicating the energy crisis , and some have even Made Big Money , in Corporate Scams , Such as Power Rentals , and Import of Costly LNG , from their Back Door foreign Partners , which have even Peel the Skin of the Poor Nation , But still the Nation is Dying due to the Power Shortages . “The number of people who have died in the heatwave has now reached 692,” Saeed Mangnejo, a senior health official in Sindh province, said on Tuesday. Karachi’s largest hospital, Post Graduate Medical College Hospital, has treated more than 3,000 patients,where they even could not even save the Lives of atleast 400 Patients , Dr Semi Jamali told the AFP news agency. Some clerics have even issued public warnings saying that physically weak people can abstain from fasting in these tough conditions. The Sindh Provincial Government Led By its Rich Leader of Pakistan People Party have taken a such a serious note of more than 1000 Deaths in a Singly City that to condemn it they have announced a public holiday to encourage residents to stay inside, an official said. ON the Other hand the Filthy Rich Prime Minister Nawaz Sharif has issued special instructions to the National Disaster Management Authority and other relevant organizations to arrange urgent assistance for the heat wave victims. Our Correspondent from Karachi Reported that most of the victims of the Blistering Heat were elderly and poor, many of them living in the streets. On Tuesday, Pakistan’s Armed forces and Paramilitary Rangers force set up medical camps at several points in Karachi where they were providing water and anti-dehydration salts. “More than 400 dead bodies have so far been received in our two mortuaries in past three days,” Edhi spokesperson Anwar Kazmi told AFP. The mortuaries reached capacity across the city , as the Relatives of the Deceased were also in a fix , as there were no arrangements for even the dead bodies , as there were even no Graves available in the established Grave yards, which are already been officially closed for the Last 20 Years , and the chaotic scenes were reported that there were Not even any ambulances or Coffin Carriers were available for the Dead Bodies to be shifted from the Hospital , or to the Grave Yard. Dozens of Dead Bodies can be witnessed in the corridors of the Govt Hospitals in the same Blistering Heat due to which they have died . High Profile Hospitals , which are famous among Rich and Elites Like Aga Khan Hospital , have closed their Emergency Departments , and refused to treat the Patients of Heat Stroke , as Most of the Patients were Poor , who could not afford their services , which are Just for the Rich People . Despite the increasing number of deaths being reported in the provincial capital, neither government officials nor any other organisation has made any arrangements for collecting and collating the data of the death toll. “The opposition is now criticising the government in Islamabad, however it is the opposition that is ruling the province of Sindh,” Hyder said. The blame game is going on but the government did not issue any early warnings to tell the people to take care or set up camps in Poor Localities , where there is the Highest death rate in the Present Scenario due to Power outages and water Shortage , for which there were already alarms raised But No Urgent Remedy was done and thus situation became worse. While temperatures in Karachi itself touched 45C in recent days, up from a normal summer temperature of 37C, meteorologists said rain was on its way. “We are anticipating a sea breeze will set in some time [on Wednesday night]. The temperature will come down as the monsoon rain enters the Sindh coast, bringing rain to the city,” Ghulam Rasool, director-general of the Meteorological Department, said. It is Not only the Pakistani Government , But the Region is in the same Boat , as the Indian Government run under the Leadership of Narendra Modi , is also an example of Bad Governance , who is an Hindu extremist , trying to create Rifts and War Hysteria , by giving Provocative Statements against Pakistan and Interfering in Yangoon against Muslims , Instead to trying to resolve Long standing Issues like Kashmir and Keeping a Close Watch on the Development of his country , so the People can Prosper , whether Hindu or Muslim or Christians. This entry was posted in Asia Pacific, Jafria, Pakistan News and tagged Blistering Heat, Blistering Heat Wave, federal government, Government, Heat Wave, Karachi, National Disaster Management Authority, pakistan, Poor Nation, Power outages, Power Shortage, Water Shortage. Bookmark the permalink.